Air Transat, one Canada's leading low-cost airlines, has announced that it will be adding new domestic flights this summer, making Europe that much more accessible to travellers from Calgary, Vancouver and Quebec City. 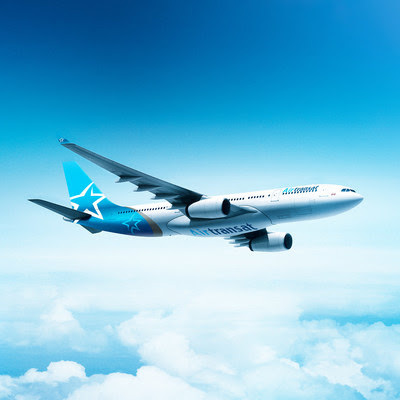 In fact, they will now have access to more than 10 new European destinations, thanks to Air Transat's connecting flights via Montreal and Toronto. "For more than 30 years, Air Transat has been the preferred holiday travel airline for Canadians flying to Europe," says Annick Guérard, Chief Operating Officer at Transat. "Our domestic flights are very popular with travellers, as they offer more choices and the flexibility to easily plan their dream vacations to Europe. This allows us to reinforce our position as leader in the transatlantic market, because a greater number of travellers are choosing the unique experience of flying with Air Transat to Europe." Travellers from the greater Calgary area will be happy to learn that they will now have access to 23 destinations in Europe with Air Transat, including eight new ones via Montreal: Bordeaux, Lyon, Marseille, Nantes and Toulouse (France); Brussels (Belgium); and Madrid and Malaga (Spain). Moreover, additional flights will be added to popular destinations via Montreal or Toronto, such as Lisbon and Porto (Portugal), Barcelona (Spain), Rome (Italy), Athens (Greece), Paris (France), Dublin (Ireland), and London and Glasgow (United Kingdom). From Vancouver, three new destinations via Montreal will be added to our summer 2018 program: Nantes, Toulouse and Malaga. Therefore, travellers from Vancouver will be able to choose from a total of 25 regions to explore. And lastly, travellers from Quebec City will now be able to visit Madrid and Nice via Montreal, in addition to enjoying more flights to Paris, Bordeaux, Brussels and Prague (Czech Republic). Let's not forget that Air Transat passengers will also be able to benefit from multi-destination flight options, making it possible to land in one European city and return from another, at no extra cost – a simple and affordable way for Canadians to discover even more destinations and get the most out of each trip. Not all travellers had the chance to visit Canada from coast to coast on its 150th anniversary. That's why Air Transat will be inaugurating a new route between Calgary and Montreal and offering three flights a week during peak season. Flights will also be added between other major cities, such as between Montreal and Quebec City (it will now have four flights a week), and Toronto and Vancouver (it will now have three flights a week). In addition, those who fly with Air Transat will be able to experience quality service on board, which has led to its recognition as the best leisure airline in North America by Skytrax. With Air Transat, vacations start even before passengers reach their destinations, thanks to the attentive crew, on-board comfort and upgrades to Option Plus and Club Class. Families will also be treated to special perks, such as priority check-in and boarding, as well as the Kids Club, which makes flying fun for mini-globetrotters.